This week’s news starts with a Kickstarter campaign and a design competition, and it also covers news from i.materialise and Materialise blogs, business news from Norsk Titanium and Premium AEROTEC, and another business update from CGHT (Changing Technologies). Finally, the ESA has announced that a lunar village could potentially replace the International Space Station. Really? Jered Adams has launched a Kickstarter campaign that wants to raise $43,200 in the next 34 days. His Limitless 1.0 CNC combo 3D Printer Controller will allow you to switch between a 3D printer and a CNC milling machine. You can make a pledge of at least $360 to get the early bird special: one controller board and one 4″ display. The user will also have to provide an Xbox controller to make this all work. If you can’t quite afford the $360 price tag, you can make a pledge of $150 or more and receive a mug with the Advanced Automative Multi-Tool logo on it, and your name on a wall of appreciation. It’s true that this classic object, although used numerous times a day, sometimes by many people, is a little boring. So why not take a few minutes out of your busy day to draw up some alternatives that will make you smile or uplift your lotioning experience? You can get all the competition details here. i.materialise has announced its Ceramics Sale, going on through January 31, 2016. This sale will allow you to save 10% on every 3D print you order in the company’s ceramic material. Maybe you’d even like to take this discounted price as an opportunity to try ceramics materials out for the first time, and if so, then you can get more information about ceramics from i.materialise here. Simply upload your design, choose the ceramics option, and place your order using the “WinterSale” promo code. Now is a great time to experiment with 3D printing in ceramics, so check out your options on the i.materialise website today. Congratulations to everyone on the Phits and Materialise teams for this award! 3D printing education is getting to be its own industry niche, and CGHT/Changing Technologies, Inc. has announced that it is considering getting into the education game as well. 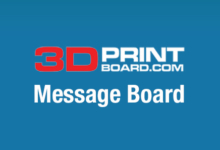 The company, which covers much ground relating to 3D printing services, including a recent announcement that it will offer a service converting CT scans to 3D printable files, acknowledges the central role 3D printing education materials will have as the industry grows. When a company like CHGT announces plans to get into the growing 3D printing education sector, this tells us to expect growth in this market. The joint qualification program is acknowledged as the “next step to develop full industrial technology maturity” for the 3D printed titanium parts market. 3D Printed Moon Village to Eventually Replace the International Space Station?! Why the moon? Woerner has been dedicated to a moon mission since he took over at the ESA because he feels that it is a key step to humans flying to Mars. We can think of worse visions for the future than a lunar village with robots and 3D printers, can’t we? What was your favorite story that we (almost) missed this week? Tell us about it in the From New 3D Printers to 3D Design Contests forum over at 3DPB.com.